The VitaLink PlantStart is the ideal product to be used during the propagation phase both by cutting and seed and guarantees a fast and healthy growth of the plant. Your seedlings and cuttings will get off to the best possible start with VitaLink PlantStart. Tried and tested countrywide for over a decade, PlantStart is blended to be the best propagation plant feed on the market. What keeps this product producing such consistent results is the carefully selected blend of ingredients. The perfect ratio of boron to calcium has been proven to promote rapid root development and vigorous early growth. Vitamin B1 helps ease the stress to the plant during the cutting process. The addition of both fulvic and humic acids aids in nutrient uptake from the moment of root emergence. 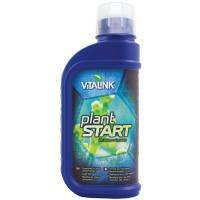 VitaLink PlantStart is a proven, gentle plant feed. Sowing seed/cuttings – Use at 3-4 ml per litre when pre-soaking propagation sponge/plugs prior to sowing seed or taking your cuttings. If taking delicate and valuable cuttings we recommend the use of a quality rooting gel to further guarantee success. For rooted seedlings and cuttings – Use at 6-8 ml per litre once your cutting/seed has successfully rooted into your propagation sponge/plug. Once you first notice the plug shooting multiple roots we would recommend incorporating VitaLink RootStim into your feeding program. Always shake the bottle prior to use as the humic acid will naturally settle over time. A grower’s hint – many growers still give cuttings and seedlings a weak dose of adult feed. Please don’t do this, as cuttings and seedlings not only need a weaker feed, they also need the right ratio of key nutrients, vitamins and minerals. Think of it this way, you wouldn’t give a new born baby steak for dinner. The same principle is applied to seedlings/cuttings, you shouldn’t feed them nutrients formulated for mature plants.